BrainSell is holding a new webinar February 11th, 2015 from 2:00 pm - 2:45 pm EST to improve awareness of the capabilities surrounding cloud and on-premise ERP platforms. BrainSell consultants Debbi Silberberg and Avron Katz will be comparing cloud-based solution NetSuite vs. on-premise solution Sage 100 ERP. According to Gartner, by 2018, at least 30 percent of service-centric companies will move the majority of their ERP applications to the cloud. As a leading ERP solution provider, BrainSell has recognized the need to strengthen their cloud offerings while maintaining a strong on-premise practice. 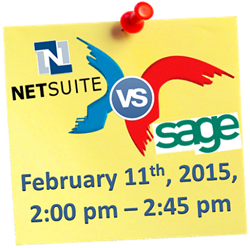 As a result, they will compare their most popular cloud and on-premise offerings; NetSuite and Sage ERP during a webinar on February 11th, 2015 at 2:00 pm. BrainSell consultant Debbi Silberberg will represent NetSuite (cloud solution), while Fellow BrainSell consultant Avron Katz will represent Sage ERP (on-premise solution). During the 45 minute webinar, Silberberg and Katz will detail many of the most important comparison points in cloud and on-premise ERP software by demoing NetSuite and Sage ERP. On-premise solutions still represent the vast majority of ERP installations and still have certain advantages that won't make on-premise obsolete anytime soon. That being said, more and more businesses are trusting cloud-based systems with SaaS-based subscription models for their ERP/accounting needs. Sage ERP has been a leading provider of on-premise solutions for over a decade. NetSuite, on the other hand, has rapidly risen to the upper echelon of cloud ERP solutions and is quickly becoming BrainSell’s go-to cloud deployment option. Having implemented hundreds of ERP projects, hosts Silberberg and Katz will be able to detail the ins-and-outs of NetSuite and Sage. As part of their suite of services, BrainSell provides additional services apart from NetSuite and Sage ERP consulting and implementation. BrainSell is a full-service CRM consultant and has relationships with Salesforce, SugarCRM, Infor, Microsoft and Act! CRM.